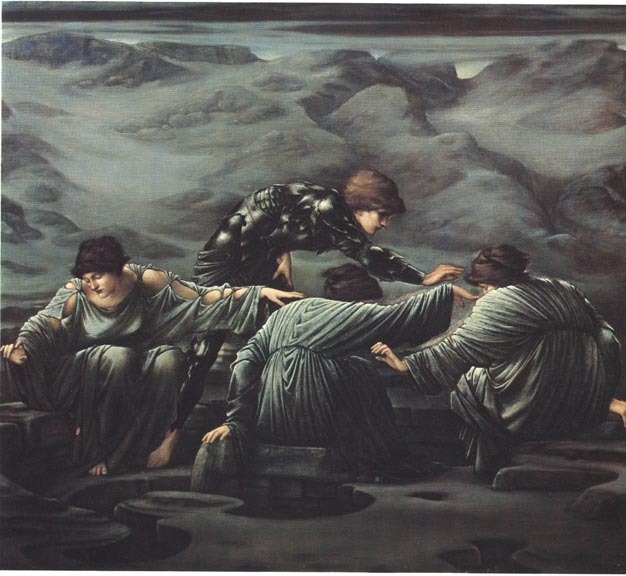 Perseus and the Graiae by Sir Edward Coley Burne-Jones, Bt ARA (1833-1898). Oil on canvas. 1892. [Number 2 in the Perseus Cycle]. Staatsgallerie Stuttgart. This picture, like other members of the series, draws upon the version of the Perseus legend that appears in the following passage in William Morris's "The Doom of King Acrisius" from The Earthly Paradise. And ever each to each the eye they sent. And verily he has the eye of me." That they were worse than ever heretofore. . . . Nor will I keep this treasure from you.